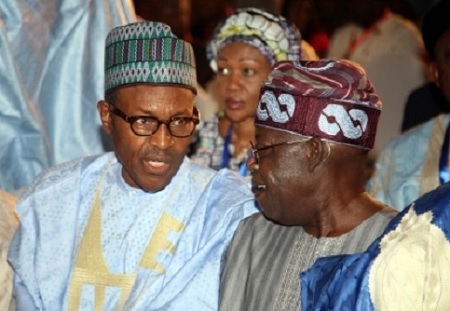 AHEAD of the 2019 and the fast approaching gubernatorial election in Osun State and Ekiti, President Muhammadu Buhari has asked the national leader of the All Progressives Congress, APC, Asiwaju Bola Ahmed Tinubu to ensure he settled the acrimonies among members nationwide. Malam Garba Shehu, the Senior Special Assistant to the President on Media and Publicity, disclosed this in a two-paragraph statement made available to journalists on Tuesday. Garba's statement read, “As part of ongoing efforts to improve cohesion within the All Progressives Congress, President Muhammadu Buhari has designated Asiwaju Bola Ahmed Tinubu to lead the consultation, reconciliation and confidence building efforts. Tinubu himself, arguably aggrieved with the leadership of the party led by Chief John Odigie-Oyegun. The former Lagos State Governor has in different fora called for the resignation of the APC national Chairman. Recently, the media was awash with Tinubu stance on his demand that there should be a fresh elective national convention that will usher in a new set of the National Working Committee of the party. In Ondo gubernatorial election that saw Rotimi Akeredolu as the winner, Oyegun's men led by Ogun State Governor, Ibikunle Amosun, former Lagos State Governor, Raji Fashola, Rivers State Governor, Rotimi Amaechi ensured the anointed candidate of Tinubu, Dr. Olusegun Abraham was frastrated out of the race. Similar scenerio played out in Kogi when James Faleke, a Tinubu anointed was denied to assume the governorship seat following the death of Audu Abubakar who died on the election day. Till date, Tinubu has not reconciled his differences with Oyegun. How he will remove the peck in others' eye with timber in his is no doubt a herculean task. Prominent among the states where there are disagreements among APC leaders and political office holders are Kano, Oyo, Rivers, Kogi, Kaduna, Zamfara and Osun States among others. In Kano, there is a disagreement between the state governor, Abdullahi Ganduje, and his predecessor, Rabiu Kwankwaso. Ganduje was deputy to Kwankwaso who is now a Senator. In Rivers State, there is also a disagreement between the Minister of Transportation, Rotimi Amaechi, and Senator Magnus Abe. In Osun State, the governor, Rauf Aregbesola and the Deputy Speaker of the House of Representatives, Yusuf Lasun, are also not in good terms. Lasun is aspiring to become the state governor after Aregbesola whose tenure expires this year. In Kaduna State, there is crisis between the state governor, Nasir El-Rufai and Senator Shehu Sani. A similar scenario is playing out in Zamfara between the state governor, Abdulaziz Yari, and Senator Kabir Marafa. Also in Kogi State, the state governor, Yahaya Bello, is at loggerheads with Senator Dino Melaye. In Oyo State, there is a friction between the state governor, Abiola Ajimobi, and the Minister of Communications, Adebayo Shittu. Shittu who is nursing a governorship ambition had petitioned the National Chairman of the APC, Chief John Odigie-Oyegun; and Tinubu, over what he described as the “unbecoming conduct” of the Governor. In the petition dated December 18, 2017, a copy of which was obtained by our correspondent on Wednesday, the minister accused the governor of alleged high-handedness.